With the help of our expert team members, we have been able to provide Metallized Polyester Film. The top quality Metallized Film manufactured by our company is made from optimum quality film for ensuing durability. 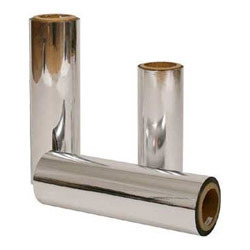 The main purpose of metallized film is to improve the quality of the product by laminating it on the paper. Our company has marked its prominence as one of the reliable manufacturers of Metallized Film in India. We are a prime manufacturer and supplier of Metalized Polyester Film / Metallized BOPP Film, which is well known for its glossy appearance. 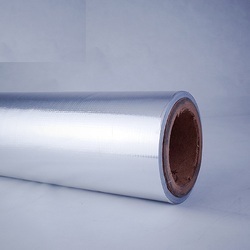 Metalized Polyester Films are extensively used for gift wrapping, twist wrappers etc. Our Metalized Polyester Film can be availed at reasonable prices. Created to address the visual appeal packaging needs of the pharma, food and confectionery industries, Day Mettle is a high performance metallised rigid PVC film available in a range of metallic colours with superior mettle adhesion properties. A real combination of aesthetics and functionality make Day Mettle the star choice where durability and sleek looks, are part of product appeal. Metalized Polyester Film required size. Matching up with the ever increasing requirements of the customers, our company is engaged in providing Metallized Polyester Film. Our company holds vast experience in this domain and is involved in offering Metallized Polyester Film.